These beautiful reclaimed oak wine barrel earrings are made with an inlay of wood set in tungsten. The hoops are 1 inch in diameter and feature a lock wire to keep them secure to your ear. 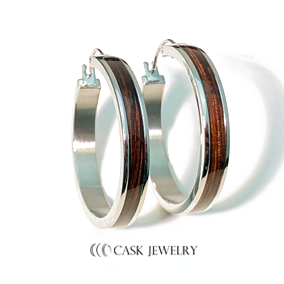 The inside of each earring is engraved with the Cask Jewelry logo. *There is some variance in the coloring of the wood earrings that you will receive compared to the wood earrings pictured.